My tall friend Casey gives me rad hand me down clothes, purses, awesomeness. Pants are always too long. I have a tailor that I adore, but I didn't plan enough ahead (standard) and wanted to wear them on a little plane vacay, of which I still haven't to blogged about! But I digress... to wear the comfy jeans on what for sure would be a Southwest middle seat flight, I needed to do a little creative tailoring myself. Which was a good or bad idea, depending on the way you look at it. 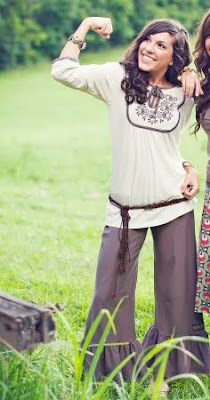 All hippie like and earthy. See, in spite of my laundry woes, I do heart the planet. i love that they are scrappy and inside out! i think they are so much cuter that way. p.s. they look rad with your sweet sandals. I've seen those matilda jane pants for little ones, never saw the adult version...cute! you're so scrappy :) love the sandals. and I can never not think of JJ when I hear those 3 words. Never ever! Awesome. So cute with the sandals. I've always wished I could sew. Great Job! I actually kind like how it turned out with them backwards! 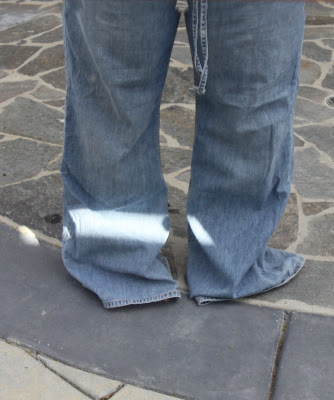 I wish jeans were too long on me, becaue I'd totally use that idea! too cute...you're brilliant!! Happy Earth Day!! Oh and happy Earth Day! TOO stinkin' CUTE!!!! and I LOVE all their "happy scrappy" look! I'm so short too!!! (5'3-if I stand real tall on my very tippy toes- and tease my wild curly hair an extra couple inches!) I'm totally stealin' this idea!! first off, i have the cocoa big ruffle pants and they are as delicious as they seem. secondly, i'm, currently getting ready to procure and old pair of dungarees to do the same. 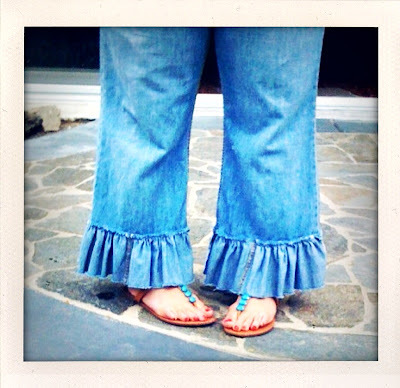 I make pants like this for the girls all the time...and every time I have to talk myself thru the ruffle like it was my first. DUH. i heart matilda jane. cutest stuff. Love them! Happy Earth Day my friend! umm... I just glanced down at the bottom of my jeans - and, oh yeah -- they're all mangled & rip & yuck. What can I say? ha! and, yes. Matilda Jane rocks my socks. love me some mj! SHUT YOUR MOUTH WHEN YOU'RE TALKING TO ME...cause I love them LOTS. OMGoodness, you rock. Sorry for the caps, I just really love them and need to shout at you to let you know that. You should save all those too-long-for-you pants bottoms and send them to me so I can sew them to the bottom of all my too-short-for-me pants. We are definitely going to need to take a picture next month with you, Heather (another shorty, like yourself), me and Mel (who has pants issues like I do.) Funny stuff! LOVE them!! Thanks for the fantastic idea!! I am short so this is perfect! So cute! And love the sandles too. and if those shoes are from the red dot boutique I have them too. great minds think alike. no stinken' way. those are darling. But, I'm too tall...pants are capris for me...can you cute that up??? Cute with them sewn that way! start a new trend!! lol! I can not .. i repeat NOT sew that well! So there ya go! Well done! Not only do your pants not look dorky, but they look so hip!! Great upcycle!! Oh how I love those! How very cute!! Its impressive that you did those. I don't do bluejean very well when it comes to sewing. Did you make the pattern up in the noggin or did you find one online? So Cool. I am so inspired to do something like this.... Thanks.